RIPLEY Firework Association has donated £10,000 to local charities following the success of its bonfire in November 2016. The beneficiaries were formally announced at its annual local giving event, which took place at Ripley Cricket Club on Sunday, 19 February. They included, Woking Hospice, Ripley’s Over-60s Club and the Surrey Air Ambulance. As well as paying for the upkeep for the Christmas lights display, the Association has also supported 10 other local community groups, including: the scouts, and other youth and adult sports groups. Since its inception in 2004, the Ripley Bonfire Night has been a huge success. 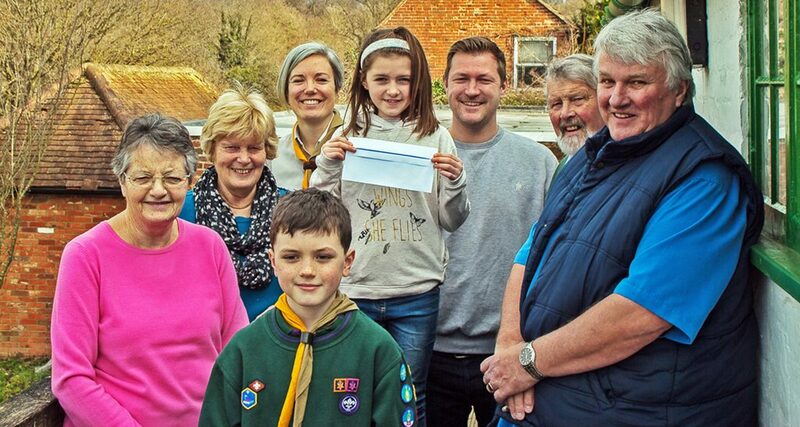 Over the past 12 years, it has raised in excess of £83,000, which has been distributed to the charities and local organisations associated with the Ripley area. From left to right: Edna Millis (chair of the over 60s), Jennie Cliff (Chair of the Parish Council), Scout Leader Sarah Harrison, Bonfire Queen Lexie Hyde who led the 2016 bonfire procession, her father Damien Hyde, Chairman of the Ripley Firework Association Vernon Wood, firework committee member Steve Hill. In centre, scout Lewis Harrison.